I think this is the perfect motto! and that's my story and I'm sticking to it! LOL, too cute. O.k that girl is standing in the middle of the road! Definitely a mistake. But I've been there too and laughing does help. That's what I like about getting older more things are funny. repeating over and over as laughter is the best medicine! I really like this motto! 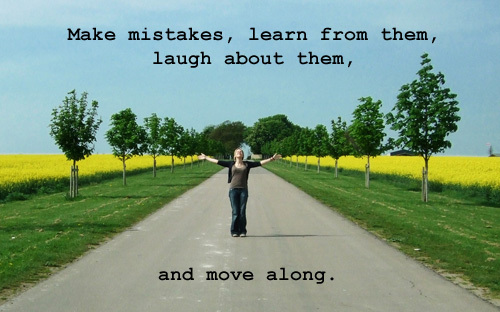 And it sure is easier to forget mistakes if you're able to laugh at them. Don't ask me how I know this!